Ski Bike Junkie: Rock-a-bye baby! I'm a ski nerd. I subscribe to two ski magazines (Skiing and Powder, in case you're wondering) and read the entire buyer's guide of each cover-to-cover every year. I even read about all the skis that I would never, ever buy because they aren't for the kind of skiing I like to do. The downside to being a ski nerd is that I know about all the other skis on the market and can therefore identify the relative shortcomings of my own. Which is why I have purchased at least one pair of skis per year for the past four years. But that brings up one of the things I love about skis. Unlike bicycles, which can cost more than the annual income of 95% of the world's population, the difference between a pair of high-end skis and some entry-level skis is a few hundred dollars. And if you're a cheapskate dirtbag like me who refuses to buy skis unless they're used or priced well below retail, the difference is even less. So after 10 or so days this year on the touring skis I have had for just over one season, I decided they weren't ideal for what I wanted them to do and had to get new ones. And since I was getting new skis, I decided I'd get new bindings as well and switch over to Dynafit. The skis I got are the K2 Anti Piste. Last season, K2 came out with the Coomba, the signature model--released posthumously--for big mountain skiing pioneer Doug Coombs. When the Coomba came out, I wanted some. But being a dirtbag, I couldn't buy them in the first year because they wouldn't be cheap enough. In the interim (in the last two months, to be precise) I decided I no longer wanted the Coomba because it didn't have a rockered tip. Enter the Anti Piste. Technically, it's a telemark ski, but it's the same shape and construction as a Coomba except with a rockered tip. Backcountryoutlet.com just happens to have them for 45% off, so I couldn't resist. What is a rockered tip, you ask? Most skis are constructed with camber, which means that if you set them unweighted on a hard, flat surface (a groomed ski run, or piste, for instance), the tips and tails would touch the surface, but not the center of the ski (the part under the boot). When the ski is weighted, this allows it to maintain edge contact throughout the length of the ski. A ski with rocker (or reverse camber) does just the opposite--the center will touch, but not the tips and tails. 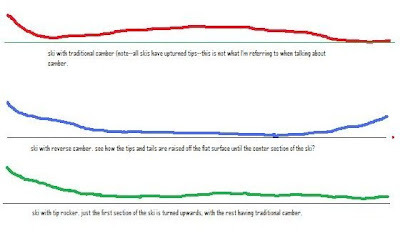 The reverse camber shape is more like a water ski or a wakeboard, which in soft snow has the effect of keeping the tips from diving and allowing the ski to plane out faster, which makes turning in soft snow a little easier, and arguably more fun. I decided to go with Dynafit bindings because they're about half the weight of my current bindings, which I'm hoping will help me avoid being the last guy up the hill. More importantly, though, when in tour mode, the binding doesn't lift up with your heel, so you're only lifting the weight of your boot and not your boot and binding. I'm hoping this will help reduce fatigue on long tours like Lone Peak. Other benefits are that the Dynafit bindings flex less than the Fritschis, allowing a more solid connection with the ski, and they have a lower stack height, which is really just a matter of personal preference, but something I like with a wider ski. The rocker on the Anti Piste is minimal--only about 3mm or so, and it's only in the first 30 cm or so of the tip (the tail has traditional camber). But it's enough. On Scottie's Bowl Saturday morning, I was surfing through the snow, able to ski from the center without worrying about my tips diving. I predict that in no more than five years, all skis that are 100mm or wider underfoot will have rocker at least in the tips. I'm yet to meet someone who's skied a reverse camber ski and wants to go back. Dug: did you grow up in the depression? stop it! mark: yeah, that approach is probably beneath me, but it's an option. Dug: do you eat bark? I don't eat bark, but if it would make time move faster so I could get out on my new skis again, I would. do you eat bark? Classic dug. I like all the ski info and hope you like your new boards. BTW, what size boots are your old skis? kris, did you just ask what size boots his old skis are? Kris, my old skis are 163cm. There are no old boots because I'm still using them. There are also no bindings on said skis because I already sold the old bindings. dug, aren't skis sized by shoe size? Ok, yes, that was a very poorly formed question. I used to be in the White House press corp during President Bush and I haven't yet adjusted to normal English. I was hoping to try Mark's old gear to see what AT is all about. Worth asking (badly). It looks fun, but I'm not sure I can afford a new activity (financially, maritally, family, (un)skillfully, etc.). but, but, i'm still not sure what you were asking. did you want to know the length of the skis or the size of his boots?